For as long as he can remember, Brett, who is an associate producer with The Lighthouse’s CRIS Radio program, has wanted to pursue a broadcasting career. The fact that he is visually impaired has not stopped him. Brett went on to earn an associate’s degree in audio production. While a patient at The Lighthouse’s Pangere Center for Inherited Retinal Diseases, he accepted an internship with CRIS. The internship gave him invaluable experience, including the opportunity to co-host a sports talk program. In his current post at CRIS, he helps develop content, provides technical support and contributes to local programming. “I’ll always be grateful to The Lighthouse for giving me this amazing opportunity,” he says. 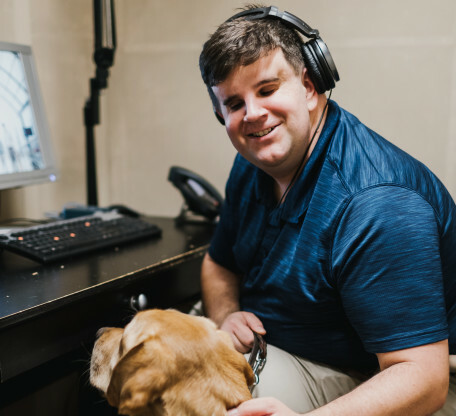 In his spare time, Brett enjoys travel, the arts and spending down time with his guide dog, Poet.